What video camera to buy? June 10, 2010 · Posted in B-Roll · Comments Off on What video camera to buy? 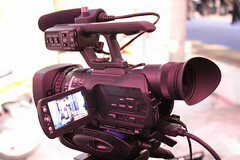 What video camera do you buy in 2010? This is a really confusing time to pick a camera. There are so many out there, none of them perfect. Choosing a camera is all about workflow. What programs are your guys going to be editing on and how new are the computers? You can’t pick equipment without looking at the whole picture. Some cameras work better with a Mac while others work better with PC’s. What are your expectations for video? Finished pieces from the person shooting it or hand off to a video editor? Web-only or for TV partner? More deadline turn-around from sports and spot news or more enterprise/feature work? Are the folks with the better cameras going to be shooting only video or do you expect them to shoot stills on the same assignments? 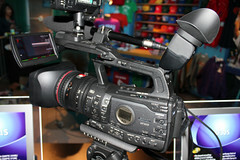 For still photographers who want to shoot some video, the video-capable DSLRs are the way to go. Forget the video cameras… it’s too much to carry. But you’ll need accessories I’ll get to in a minute. We sometimes partner with photogs from the Sun-Sentinel and they’re mostly using the JVC HM100’s now. They love it because they can just ingest from the card and hand off to their TV folks – they don’t have to edit anything. The editing workflow if you’re Mac-based is great. You can edit right off the cards with Final Cut Pro. But it’s high-def so you still have to deal with render times. The JVC camera doesn’t lend itself to easy manual control so everyone ends up shooting in auto. The zoom is pretty short – only 10x, I think, so it’s not very good for long-throw press conferences or distant spot news. Battery life is poor compared to the competition. The image stabilization is really poor so it doesn’t do well hand-held. But it’s tiny, reasonably well-built, gives a pretty good image, and is lower-priced compared to other video cameras. However, if you have high-end video folks who are solely dedicated to doing video, get them a better camera. Sony EX1r or the new Canon XF300 if you have the budget, otherwise the tape cameras – either the Sony Z5U or the Canon XHA1S. Tapeless is not the be-all and end-all… if you’re working only for the web and don’t need to broadcast high-def, the ability to down-convert to SD when you capture tape will really reduce your overall work time. Render times are reduced to almost nothing and there is no time spent on archiving. If you’re Final Cut Pro based, get the Canon, which has the bonus of being able to take analog in, so you can record pool feeds right into the camera. If you’re PC based, get the Sony and the optional flash card memory recording unit, which will let you skip the capture part – but I’m told it doesn’t play so well with Final Cut. I’m not a fan of AVCHD cameras… you’ve got conversion time on the front end and archive time on the back end. But the size and price might make up for the hassle. For low budgets, the $600 Vixia cameras can’t be beat at the price, if you can live with the AVCHD workflow. For the still cameras, I recommend the Sennheiser MKE400 mini shotgun mic and a Sennheiser wireless mic. Using either one straight into the camera will work fine for nat sound. For more serious audio, skip the xlr adapter and get a Zoom H4N audio recorder (for interviews, music, and press conferences) and teach people to synch up the sound afterwards or to shoot video like it was a Soundslide, with an un-synched audio track. Get an Electro Voice RE50 interview mic for the Zoom, along with the shotgun and wireless lav. Everyone who shoots video should have an RE50 – it’s the most useful mic you can have. For tripods, skip the Manfrottos, bite the bullet, and get Sachtlers. They’re pro and will last. Get the reporters a Kodak Zi8 and a $30 wired Audio Technica lavalier mic and a tabletop tripod. Cheap and good enough.